No, no, no ! Since two centuries, all the stories begin by “once upon a time”. Mine will start by something else. Moreover, it’s not precisely about my story, it’s as well about theirs. Then, imagine the sire Perrault’s gnashing of teeth, if beyond the grave, he was reading the first words of my diary, I quote : once upon a time, twice upon a time, ten times, twenty times, thirty times upon a time ! It’s likely that the old academician, hundred eighty four years old today, slip on as quickly as possible his wig and his lace jabot to come to pull my ears. And honestly, what would I do with a ghost in the lighthouse? A grumbler spectre escaped from Saint Benoit’s cemetery in Paris, for expunge this affront to his immortal quotation : Once upon a time. Madam Lechêne is my governess, and she has this personal way to know everything about everything. From aquatic plants names to birds ones. From the names of the constellations, in ancient Greek, please; to those delicious food that she cooks on the cast iron stove, in the lighthouse’s small kitchen. When I write : “this personal way to know everything about everything” I’m carefully weighing my words because I suspect her to have abused of my child naivety by inventing a lot of silly definitions to describe things nearest to us. Prank at which she was forced to stop when I was able to read the old books put under the spiral staircase leading up to the lighthouse’s lantern. 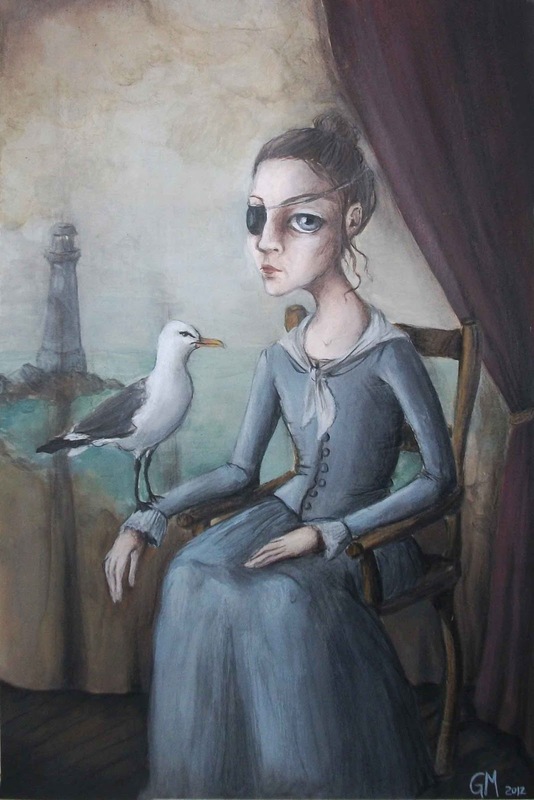 Three days ago, Madam Lechêne left me alone in the tower to collect clams on the rocks. Since then, she never came back. Maybe she has been taken by an old fisherman or a loneliest captain in his drifting ghost ship. She might but I doubt it. My governess was too ugly for someone wanting to take her in the shade of its boat sails. Her hands were too dry, too calloused, and her shin was so rough that it could be possible to blaze matches on it. Her long nose, as for it, and her perfect bun, gave her a strange courtesan look. Her eye yet, her eye which took the Ocean’s color when the clouds move towards the north, concealed a thousand beauties which could have moved a man , if her deformed skeleton had not given her such a frightening figure. As I write to you, I am in my governess’s room. And maybe this is here that my story should begin. In this mysterious decor that I was not allowed to visit since my parents locked me up in the lighthouse. In the middle of the ocean, far away from Britain’s coasts. What an idiot! I fell asleep ! It was late indeed, and this bed is so…so comfortable compare to mine ! I’m however surprised how quickly I fell asleep. I was so flabbergast…disappointed about what I had discovered in this room. Flabbergasted? Disappointed? I don’t know. The only thing I am sure of is that the storm has raised. Some strong gusts of wind make the window pane tremble and if I left my imagination run, I could believe that the entire lighthouse will rise up in the air at any moment, taken away by the gigantic waves that are slapping it’s great blue stones tower. If I am afraid? Of course I’m afraid! In fact, I hid under the bed with my candle. As I write to you, I can assure you two things: the first one is that I slept two hours and the second one is that the candle will be consumed in forty five minutes (Madam Lechêne has always encouraged me to graduate my candles). 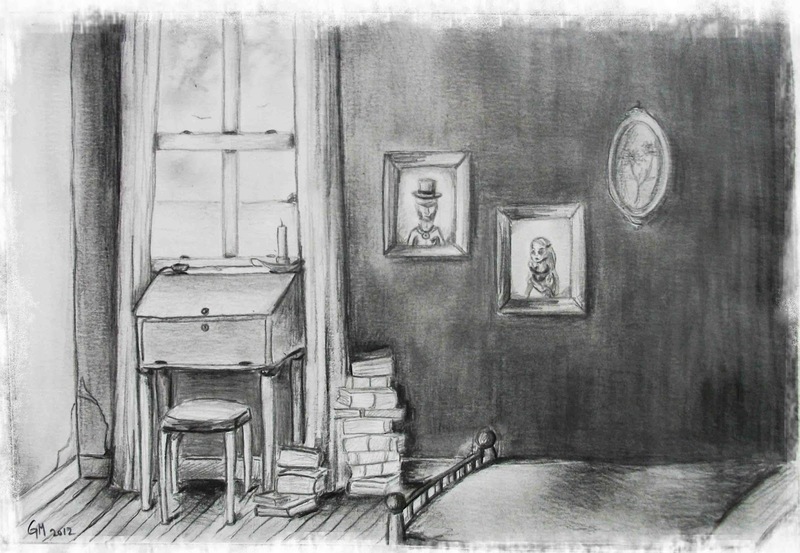 Therefore, I have this laps of time to describe you my governess’s room. The first thought who crossed my mind was full of perplexity when I pushed this door. How could I traduce you this resentment in comprehensible terms? Let’s simply say that at first sight, this place is fantastically…tremendously…horribly…furiously…boring. A frozen time atmosphere is floating in the air, apparently emanating from the decor itself, from the grand bed, the woven straw chair and the old writing desk. The long curtains surrounding the window are straight and of a sad greenish color, the walls are crackling and even crumbling in certain areas. At each step, and I can assure you that I’m not heavy, the floor emits strange creaking which would make the bravest pirate blood’s run cold. In fact, I won’t lie if I tell you that I quickly went on the bed (also squeaky, but much less terrifying) so I didn’t have to ear those ignoble crunches. Some details of this sad decor however hold my attention. What I first took for old dictionaries piled up under the secretaire, for example, turned out later to be enigmatic works about incredible tales from distant cultures, occult sciences and even sorcery. I examined each book’s cover, cautiously manipulating them, afraid of my governess’s remonstrance if she come back one day and discovers that I violated her lair’s secret. To be sincere, I was not surprised at all that Madame Lechêne’s spirit was a voracious reader of this kind of literature. The opposite would even have been surprising as her personality seemed such a subtle blending of eccentricity and Puritanism. The paintings that I saw then next to the window made my blood curdled. Although they where other ones fixed here and there in the wall’s plaster, two portraits turned out to be particularly frightening. The first one shows a gentleman of an age that could have my father if he were still alive. Maybe should I get out of my hiding place to describe you this macabre character, but don’t kid yourselves: there is now way I’m going to leave this place until I’ll be forced to. 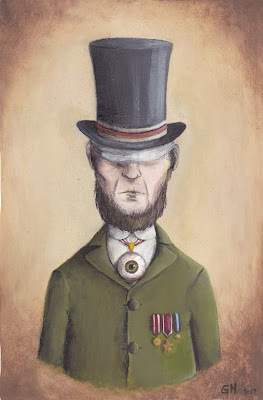 There is no need to insist and I will only be able to give you this description for now: the man, who could be an army officer judging by the medals pinned on his vest, wears a top hat decorated by a red and white ribbon. He is dressed in an olive green frock coat and a white high collar shirt. His very well trimmed beard is framing a pale face with hollow cheeks. Its non-expression is probably due to the white headband dissimulating the eyes. At his neck, and that’s what unambiguously overwhelmed me, an enormous eye is worn as a pendant. A cow eye, a rhinoceros or an elephant one that is fixing straight ahead as if it was able to see beyond the tangible world. 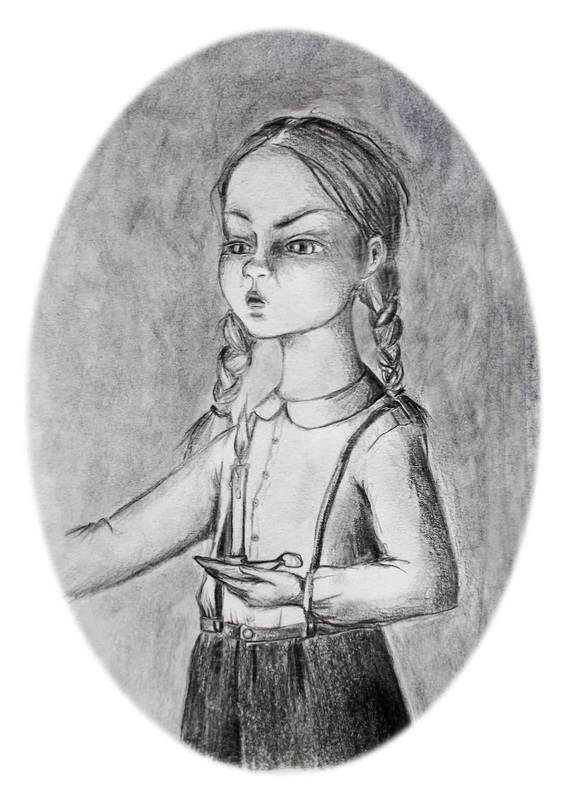 On the second portrait I could see a little girl with long hair of an almost translucid blond. She should not be very much older than me. 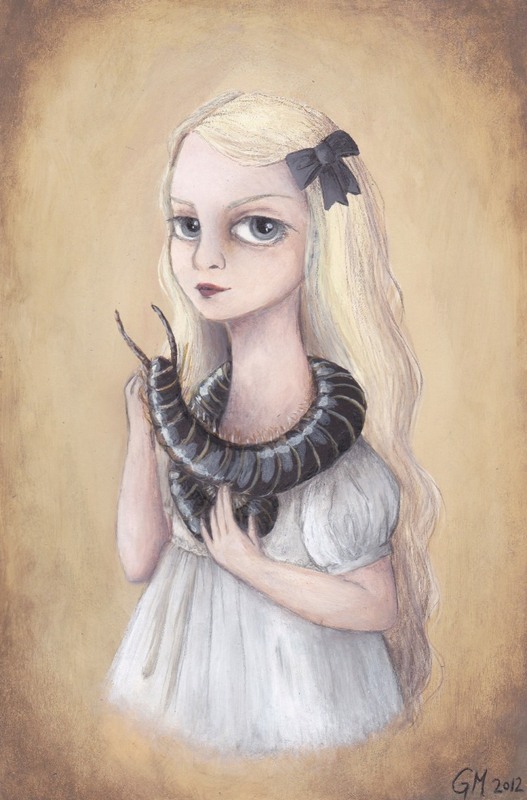 She’s wearing a pretty pale blue dress and I must admit that she is very beautiful, despite the horrible centipede she is wearing around her neck…I saw once this ignoble creature in one of the encyclopedia volumes stored under the stairs. It’s an archispirostreptus gigas. « Gigas »… and…encyclopedias are not lying, it is gigantic.